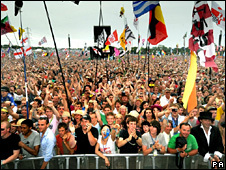 Tickets for the 2010 Glastonbury Music Festival sold out in less than a day. Fans were able to buy tickets from 0900 BST on Sunday under a registration system which was set up in 2007 to stamp out ticket touting. A festival spokesman said the system has been a success because "we know all tickets are going to festival-goers". Next year will be the 40th anniversary of the festival and its organiser Michael Eavis had said expectations were "really high". It has also been revealed that Mr Eavis is planning to extend the current four-year licence to 2011. It is expected the event will not take place in 2012 to allow the Somerset site to recover. A statement on the festival website confirmed the event was sold out. It read: "Thank you to all those who bought tickets. Confirmation emails are still in the process of being sent out. "For those who didn't manage to reserve or buy tickets today (Sunday), there will be a small number of tickets on sale over the coming weeks when any failed transactions have been cancelled." The 2009 festival attracted 137,000 music fans and featured Blur, Neil Young and Bruce Springsteen.